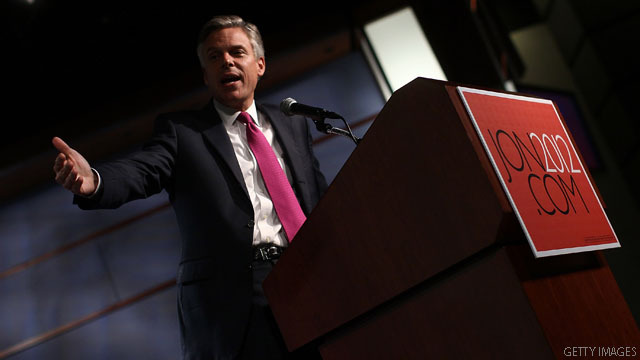 (CNN) – Jon Huntsman unleashed new attack lines on two of his rivals for the Republican presidential nomination Friday. The former Utah governor called Mitt Romney a "perfectly lubricated weather vane" and Herman Cain "the flavor of the week," in an interview with Wolf Blitzer. Huntsman continued popular criticism of Romney, the former Massachusetts governor, by accusing him of changing his positions on issues including Libya, the debt ceiling and Ohio's bill to limit the collective bargaining rights of union workers. "You can't be a perfectly lubricated weather vane on the important issues of the day," Huntsman said. "Romney has been missing in action in terms of showing any kind of leadership." "I do believe that the electorate this go around will be looking for clearly defined presidential leadership and I'm not sure we're seeing that," Huntsman added. The former U.S. ambassador to China who has received single digit support in national and state-wide polls also suggested Cain's rise in recent polling is temporary. "Oftentimes you can spike for the moment, you're the flavor of the week or the flavor of the month," Huntsman said. "I remember when Gov. Perry was at 20% in New Hampshire. He came with great fanfare, now he's in the low single digits." "We're just trying a steady, gradual, substantive rise in New Hampshire based upon real support," Huntsman said. - Watch the full interview with Huntsman on CNN's "The Situation Room" at 4 p.m. ET. You hit the nail firmly on the head. The abject stupidity and purposeful ignorance that are lauded in today's [R] party is pathetic. It is the very reason that someone like Huntsman wil not come even close to getting the nomination.....he's more likely to be completely thrown out of the Club of Idiots. My concern for someone like Huntsman is that, having presumably gauged the infectious stupidity and delusion that is rife within the [R] party, why does he choose to remain a [R]??!! That alone shows terrible judgement, so bad in fact that I would question his ability to serve effectively in any high office. Romney and Huntsman are both great people. They both try to follow Christ their savior as close as they can...They are true Christians....more Christlike than any of the other candidates out there...Great for both of them....May the best man win!!!! @mark moore - I say that you are correct. The only one that seems to make any sense is Huntsman, and there is no chance of him getting through the nomination process. The reason why is that he is not so far to the right as everyone else and he is not willing to let ideology control him. Pragmatism is not going to get you any where in the GOP. Huntsman is the ONLY repub I would consider voting for. Perhaps he should drop out of the rethugliban race and run as an independent. You mean an idealogue like former Mr.President Obama ? The left is trying so hard to make Romney the canidate. I don't like Huntsman because I don't like how he stabbed Obama in the back. The President gives a republican a position in his cabinet and then he goes against him. Could have waited until 2016. The real story here is that somehow Romney has convinced the Republican party that he is conservative. To suggest Romney is more conservative than Huntsman is a huge stretch and the party is simply falling into a false narrative perpetuated by the news media and talk radio. Records are more relevant than words. Jon Huntsman passed record tax cuts & reforms, free market health care reform, and school voucher programs. He strengthened pro life laws (with notifications laws and automatic abortion ban if Row V Wade is overturned), and enhanced 2nd Amendment right to carry laws. Romney on the other hand ran on a pro choice platform in the past, actually passed a Health Care Mandate, and has simply had very few consistent positions. Any objective person would conclude that Huntsman is actually a conservative who has a unique ability to convince democrats and independents that he isn't. One or two moderate positions has some how labeled him a liberal, and its very unfortunate. He would wipe the floor Obama and be a great ambassador of fiscal conservatism to independents that have fled the republican party. The Republican party needs to take a real look at Huntsman. He has the only serious tax reform plan and the only real foreign policy vision that is geared for this century and the economic opportunities of the Asia-Pacific region. Oh shut-up. Who cares what you think? From what I hear not even his own party cares. I was listening to Huntsman until when he started attacking his former boss (the President). From that time I found him is good for nothing! Huntsman is what a Republican looked like before President Clinton was elected and the GOP began its march to right-wing insanity. As a lifetime Republican I would vote for Huntsman over Obama, but Obama over any of the other GOP candidates. I wish he could win.. but frankly, I doubt it.. they push mittens, they push German Kane (Think about, the party of no with a leader going "Nien! Nien! Nien! "), but this guy, who talks clearly, answers questions, pays attention, works hard, has a great record.. they're not feeling this guy. But the liars, cheats, and loons... well, let's just vote for them. Republicans don't vote for "Substance" they vote for "stance"
While Huntsman has no chance, GOP voters need to realize that the only reason the non-conservative Romney is the alleged (contrived, manufactured, illusory, so-called, imitation of a, etc.) frontrunner is because there are people in the GOP leadership who are still stuck in the past and think that it is Romney's "turn", like McCain and Dole (and Bush Sr. and Reagan and Nixon and many others) in the past. That bad mentality means they want a losing candidate instead of a winning one, and that is going to destroy any chance they have of winning the White House in one year. And dont forget Flip Romney makes a great name for a weatherman ! "Huntsman is what a Republican looked like before President Clinton was elected and the GOP began its march to right-wing insanity. As a lifetime Republican I would vote for Huntsman over Obama, but Obama over any of the other GOP candidates." Oh, I dunno about that. The only thing that really changed about GOP politics when Clinton was elected is that they started marching in that direction more openly...perhaps a little faster too...but they'd already been goose-stepping towards extremism well before then. Romney, he changes his positions as often as his magic underwear. Dont even get it twisted fools..., the dnc knows Romney is the man, and will get the nom. Yeah, okay, Huntsman. You're a RINO.